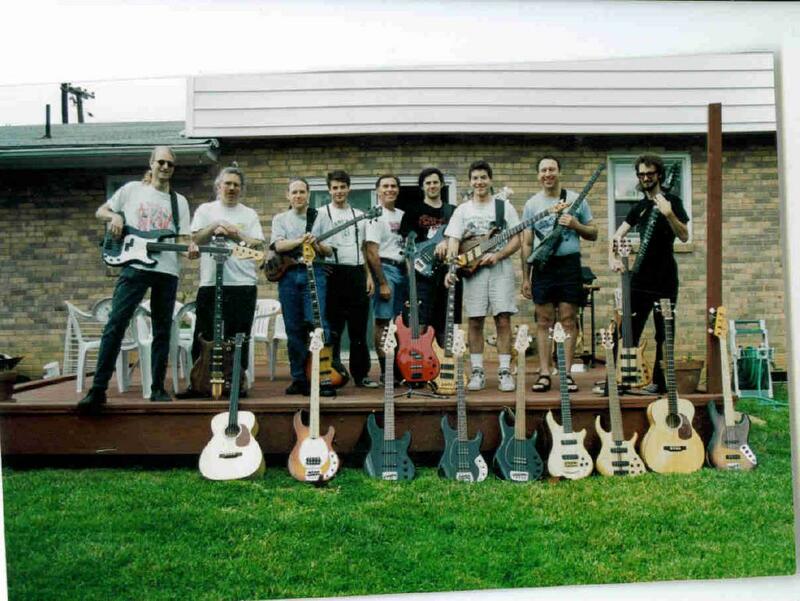 On May 21st, 1995, a group of Washington DC area bass players, who had been communicating via mailing list, met face-to-face for the first time at Eric Carter's house in Silver Spring, Maryland. We had a great time playing and talking bass. We definitely had enough gear to shake Eric's house. The people, from left to right: John Young, Cliff Laufer, Barry Warsaw, Eric Leifert, Eric Carter, Scott Evans, Tom Diepenbrock, Steve Reiter, Stuart Mawler. (front row): Fretless Martin B-65, Musicman Stingray 4, G&L, 1981 MusicMan Sabre, Musicman Stingray 5, 1991 Alembic Essence, Tobias, 1992 Martin B-65, 1975 Fender Jazz. (back row): 1975 fretless Fender Precision (w/Jazz neck of unknown origin), Alembec 8-string, 1990 Warwick fretless Thumb 4, 1972 Fender Jazz, ?? ?, ?? ?, MusicMan Sterling Fretless, ?? ?, Steinberger, Tobias 6-string, Chapman Stick.